these grew so fast I was amazed. I am waiting for the flowers to come out but for now it looks like its liking the spot I put them in. The late-blooming Joe Pye plant (Eutrochium) grows between three to eight feet tall. It produces over 100 threadlike blossoms in a cloud formation in late summer and early fall. Its unusual blue-green foliage and cloud-formation bloom make it an ideal candidate to be a garden focal point. While most flowers on this perineal are pink, white and purple varieties exist. After the flowers die, this plant produces a large seedhead before eventually dropping its seed. This plant prefers rich well-drained soils, but it will tolerate less than ideal conditions reasonably well. It likes full sun but can be raised in partial shade. Joe Pye can tolerate clay and wet soils, it requires constant moisture and should never be allowed dry out otherwise the foliage would scorch in the sun. It will provide a spectacular show when it blooms if planted in mass. It does require roughly 5 feet of space in between plants. You will usually find it growing on wooded slopes, wet meadows, and thickets. Joe Pye Plant, officially known as Eutrochium purpureum kidney-root, is an excellent addition to the gardens and courtyard as it can produce a fresh splash of colors, especially in the late summer. 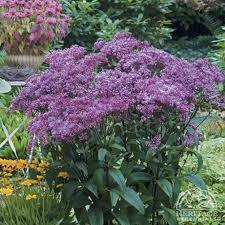 Its large pinkish-purple flowers with flat or doomed-top clusters making it an excellent choice to plant in groups and offers spectacular views. It should be noted that each flower cluster has 5-7 florets. Joe Pye blossoms usually from mid-summer to the early weeks of fall.